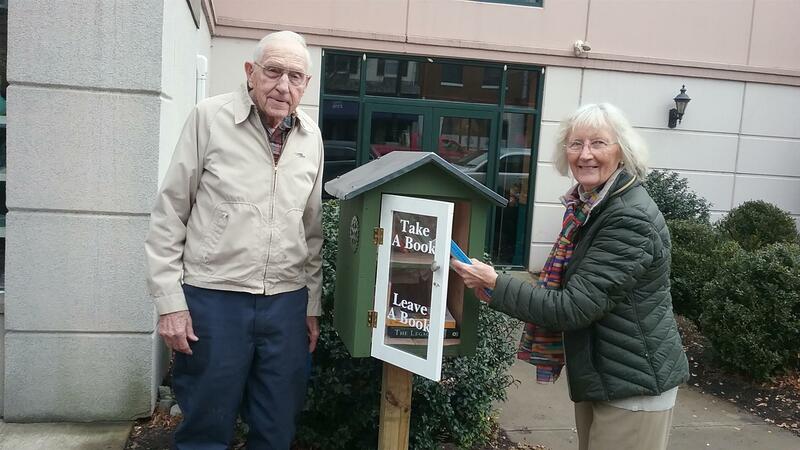 To promote literacy in our community, the Tunkhannock Rotary has installed 5 free mini-libraries in the Tunkhannock area. The libraries were built by Norm Werkheiser and the project was led by Marta Kovacs-Ruiz. The first library was installed outside the Wyoming County Cultural Center at the Dietrich Theater (photo below). Participants are encouraged to take a book and, if possible, leave a book in the library for others. There is no charge for the books. Additional mini-libraries have been installed at: Creekside Gardens, Lazybrook Park, Eaton Hills and Susquehanna Apartments. The Club is grateful to the Tunkhannock Public Library and its Executive Director and Rotarian Kristin Smith-Gary for the donation of some books for the mini-libraries from their surplus books collected, but not sold, at their periodic book sale fund-raisers. The mini-libraries project was funded by the proceeds from the 2017 Harvest & Wine Festival and is part of Rotary’s commitment to “making a difference” in our community. Norm Werkheiser, who built the libraries and Marta Kovacs-Ruiz, who was the Project Chair.